FrancolinHof is ideally situated on the border of Fernkloof Nature Reserve so you can stroll directly onto the mountain or take a steeper climb if you are more energetic! Enjoy a sundowner on your balcony as you watch the sun set over the bay, a good meal out and a peaceful night’s sleep far from the noise of traffic. The Blue Flag Grotto Beach and the world-famous Cliff Path are just a ten minute walk downhill. The centre of Hermanus with its Old Harbour, restaurants and Hermanus Golf Club is 5km away. Arabella Golf Club is reachable in 20 minutes by car. 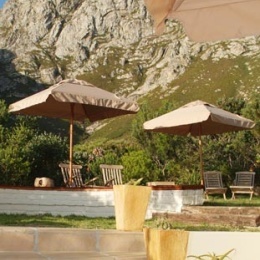 FrancolinHof is an owner-managed guest house and has one of the loveliest views in Hermanus of both sea and mountain from all luxury rooms. Stylish yet informal, FrancolinHof is decorated with attention to detail and for your comfort, offering a memorable stay in an unforgettable environment. Just relax or explore Hermanus and the Overberg. Enjoy views of the fynbos covered slopes, a wide variety of birds and Walker Bay with whales in the distance (from July to November).